In Revelation, Sigurdsson continues his photographic exploration of themes relating to nature, the man-made or the sublime, and culture and consumer society; engaging with sculptural and painterly elements through the detail of various materials and surfaces. Sigurdsson’s works often depict prefabricated materials or objects that are re-constructed or placed in situ. 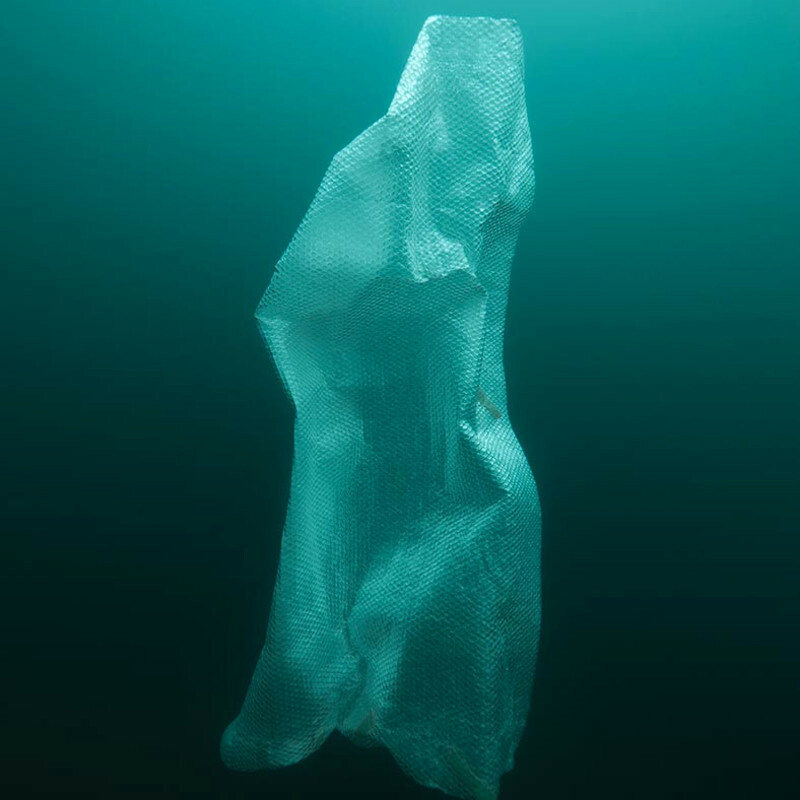 In Revelation, sheets of bubble wrap float underwater in free-form configurations suggesting a sculptural mass: an illusory paradox given the tremendous pressure of the water and relative weightlessness of the plastic. While bubble wrap in water could seem nothing more than drifting litter, the spiritual tone of the work’s title is not misplaced. The air trapped in the plastic generates a sense of life within the inorganic shells, imbuing the shapes with an eerie power. Set against the backdrop of an infinite, dark abyss, the forms do achieve a mystical, transcendent aspect. In its theatricality, and through the folds and indentations in the luminous plastic, the work also evokes art-historical references; the baroque fold for instance. What is hidden is indeed the featureless depth of the water; the wrapping does not cover anything, it is the only signifying element of each image. Thus, the politics of representation are, as in baroque art, inverse; the wrapping shows precisely that which it otherwise would serve to conceal. Hrafnkell Sigurdsson (b. 1963) lives and works in Reykjavík. He studied at the Icelandic College of Art and Crafts, at the Jan Van Eyck Academie, Maastricht, and at Goldsmiths College, London.